The New York Times has a great spread of twelve easy recipes for grilled eggplant. (It even prints out nicely on a single page arranged by rounds, halves, planks and whole.) Looking forward to trying all twelve recipes in the next weeks. Last week, I harvested my first eggplants — both finger and globe — of the season as well as the first tomatoes. As you know from previous posts, roasted eggplant with its smoky silkiness is one of my favorite garden treats. This year — perhaps, because of the heat — appears a good year for eggplant with lots of lavender flowers on the plants. Once harvested, eggplant prefers to sit on the counter rather than chill in the refrigerator which is why I cook it same day I pick it. 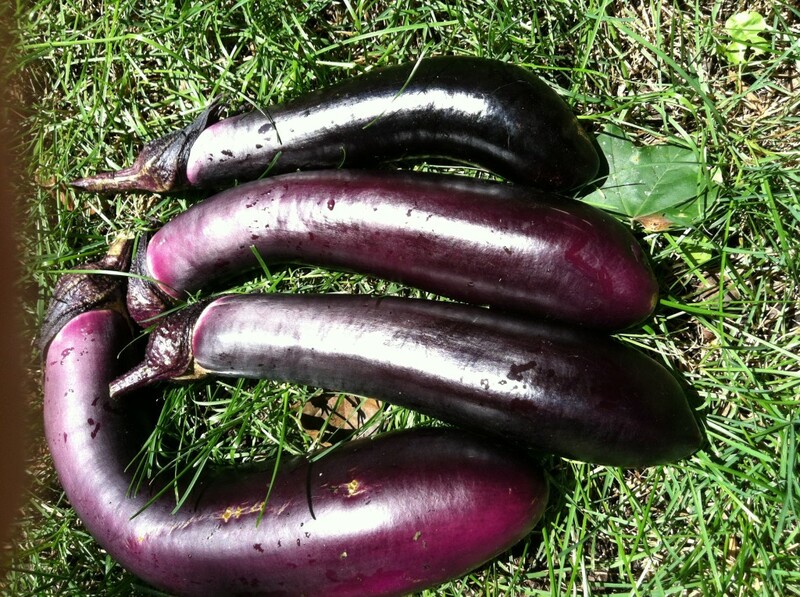 Whether grilled or roasted, eggplant freezes well for late fall and winter enjoyment too.